the Sixth Antwerp Diamond Trade Fair was full of warmth, sparkle, and enthusiasm. For more than 400 years, diamantaires in Antwerp, Belgium conducted their business in private, discreetly, behind closed doors. But, that all changed in 2010 when they opened up the historical trading halls of the 107-year-old Antwerp Diamond Bourse and the even older Antwerp Diamond Club to buyers at the Antwerp Diamond Trade Fair (ADTF), who came to see some of the largest selections of polished diamonds in the world. The fair was so successful that, in 2014, the ADTF opened a third hall, the Antwerp Diamond Kring. Now in its sixth edition, with some 90 exhibitors, the by-invitation-only ADTF, sponsored by the Antwerp World Diamond Centre, has become so well recognized that fair officials lamented the fact that they received more requests to exhibit than they could accommodate. In addition to the show itself, held February 1 to 3, the fair organized a variety of networking events, including a spectacular gala dinner, visits to diamond grading labs, and informative breakfast seminars, which included very informative talks by Marijan Dundek from Graff, London, and Katrien De Corte, Chief Officer of Education at HRD, Antwerp. From a historical point of view, Antwerp has stood at the epicentre of the global diamond trade. Through wars, economic depressions, shifts in the balance of rough diamond production, and the birth of new markets for diamond jewellery, the Flemish city has cemented its role as a capital of the international diamond business. The slogan “Cut in Antwerp” embodies more than 550 years of diamond heritage, which, for centuries, has been—and still is—a trademark of supreme quality and craftsmanship. Today, Antwerp continues to confirm its leadership role in the global diamond trade. More than 50 percent of the world’s polished diamonds and 84 percent of rough diamonds are traded in the city, thus providing customers a wide selection. Diamonds represent 5 percent of total Belgian exports and 15 percent of all Belgian exports outside the European Union, making diamonds the most important export product outside the EU. Last year, a total of 227.2 million carats of rough and polished diamonds were traded, with a value of $58.8 billion, surpassing the 2012 record of $56.5 billion. Yet, these record-breaking figures are sharply contradicted by the difficult situation for individual diamond traders. The announced winding down of the Antwerp Diamond Bank and narrowing profit margins felt in diamond hubs throughout the world, have resulted in a tough year for diamond traders in Antwerp and worldwide. Strolling the corridors in the three historic halls provided the opportunity to see a variety of amazing diamonds, ranging in size from a few points to many carats, from whites to intense fancies, and from traditional cuts to unusual shapes. A few are presented here. In the fancy color category, Antwerp Cut, a natural colored diamond manufacturer since 1989, showcased an incredible assortment of colored stones, among them purple, red, green, and blue. The brand’s suite of intense yellows attracted a great deal of attention. “These natural yellow diamonds are from the Zimmi mine in Sierra Leone, and present a level of saturation that sets them apart from the ordinary gems,” explained Mike Akiki, Managing Director. “They are among the very few natural color diamonds that can be cut into traditional round brilliants while keeping a superior level of color.” He added that it took him years to collect the 20 round brilliant-cut Zimmi diamonds used to create the one-of-a-kind layout that was showcased at the ADTF. Diarough also displayed a number of remarkable fancy colors including an intense green and a lovely purplish diamond, both of which “attracted a lot of attention,” confided Marianne Georges, of Diarough. Fancy colors, many in marquise cuts, were also seen at Diamprest, in pairs and singles, mostly pink, brown, and yellow, averaging around 0.75 carat. “They sold quite well,” declared company president Antoine Haddad. Also expressing satisfaction with the fair was Mayank Mehta, of Blooming Star, which deals in Surat-polished white stones of 0.5 to 5 carats. Adesh Shah of Antwerp-based Para Gems indicated that they also polish stones, from 0.03 to 5 carats, in Surat. Shah added that the fair was “good and an excellent networking event.” Also applauding the networking opportunities was Vishal Mehta of Divine, with a range of sizes and qualities of white diamonds. While most companies carried a wide range of diamonds, generally from 3 points to 5 to 10 carats, in a variety of cuts, some specialized in rose cuts. Among them was Vulcan, featuring 2 to 8 carats, DE/VS+, as well as other fancy shapes, cut in India. A few other companies dealt primarily with matching pairs in fancy cuts, such as family-run Forever Diamonds, managed by Audrey Benisty along with her mother Sonia. Brachfeld, a fifth-generation company, showcased a range of calibrated pear shapes, 0.25 to 2.5 carats, DEF/VVI+. “Pears are our specialty,” smiled Chaski Brachfeld, who expressed his satisfaction with the show. Another company featuring mostly pears along with some hearts, 3 to 5 carats, was My Dear Diamond. They also offered a couple of large stones, 18.30 carats and 20.26 carats, MVS12. In the exclusive-cut domain, Krochmal and Lieber, with quality diamonds ranging from 3 to 70 carats, showcased their Korloff and Lucére branded diamonds. Innovation is a hallmark of Antwerp diamantaires and probably the most unusual diamond at the ADTF was the Buddha Cut. In the shape of a meditating Buddha, it has 33 crown facets, 21 pavilion facets in addition to the culet, and a polished girdle. Available in three different versions, these tiny sculptural diamonds weigh between 0.30 and 3 carats, and are 5 to 12 mm in height. Laser-inscribed with an individual serial number on the girdle, these unique diamonds are manufactured by Antwerp-based Buddha Diamond Company. The most creative booth design was that of Beauty Gems, which displayed not only the brand’s logo in diamonds (52.42 carats) but also a map of the world. Created by Liesbeth Cleen, the map featured more than 2000 diamonds, for a total weight of 21.83 carats. Cleen stated that she was happy with the response to the display as well as business conducted at the show. Beauty Gems also sold a wide variety of black diamonds, but noted that they did not sell as well as the whites. On a different note, in addition to featuring its range of white diamonds from 30 points to 10 carats, SDE Group displayed a special app designed for its clients who then resell to other customers. 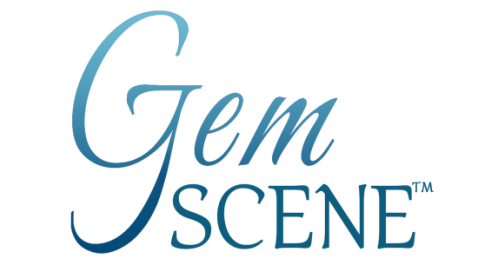 They can log on to SDE’s basic website and diamond inventory, but then can upload their own logo and desired markup, before showing it to their own clients. “It becomes like their own website, with their own prices,” explained Liat Edelstein. “We are the only one to offer this kind of service. Diamonds in all colors, shapes and sizes, were available at the Antwerp Diamond Trade Fair, February 1 to 3, 2015. Beauty Gems showcased a world map at their stand made of more than 2000 diamonds, totaling nearly 22 carats. 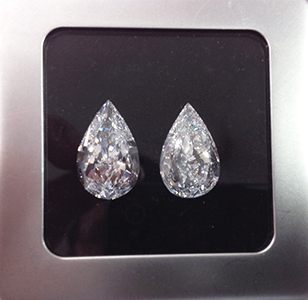 A specialist in pear shapes, Brachfeld featured these five-carat pair diamonds at the ADTF. A suite of superb intense yellow diamonds from the Zimmi Mine was showcased by Antwerp Cut. This remarkable Buddha Cut was created by Antwerp-based Buddha Diamond Company. An intense 1.74-ct green and a 0.25-ct purplish-pink diamond were displayed by Diarough. Krochmal and Lieber presented their branded 65-faceted Korloff, top, and Lucére, bottom, also with 65 facets.